Bubble soccer is the hottest new thing around. Our bubbles are commercial grade quality to be impact absorbing and easy to use. Each bubble is equipped with adjustable safety straps and handles to ensure the safety of all players. 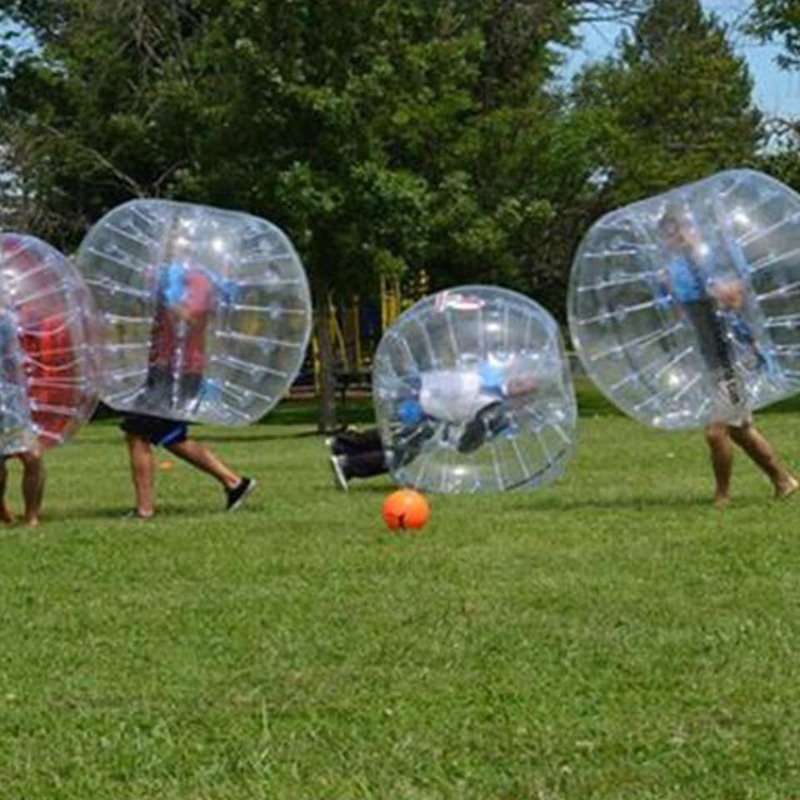 Bubble Soccer is fun for any occasion! We provide the bubbles, soccer balls, cones, and nets, to outline the field. We even provide a referee to ensure safe play and loads of fun! So, grab your family, friends, or co-workers for an exciting game of Bubble Soccer! A waiver is required for every person participating. Athletic shoes are required. No jewelry, eyeglasses, belts, or sharp objects are allowed to be worn or brought into the bubbles. Is there a height/weight requirement? Yes, we require players to be 4'6" to 6’2”. This is purely for safety reasons. However, different body types outside of this range may be able to fit. Just ask us. Smaller kids may still fit but might not be able to play some of the games. Our biggest concern with taller people is that your head does not stick out the top of the bubble which could result in neck injuries. Before play begins we will oversee everyone get into the bubble balls, adjust their straps, and ensure they are fitted properly for their size. There is no weight limit but the inner diameter of the balls is 55”. Generally people 250 pounds and less fit the best. Those with prior heart or back conditions or women who are pregnant will not be able to play unless you consult with your physician first. Any health issue restricting you from physical activity should not participate. Examples: Asthma, wearing a cast, splint or boot. If you are claustrophobic, you probably do not want to play. The bubble balls weigh approximately 17 pounds. You must be physically able to hold up that weight. You should wear athletic shoes to play. Comfortable shorts or pants. A regular T-shirt that covers your back and shoulders. You do not want to wear a sweatshirt as it does get hot when running around in the bubble balls. Knee pads are recommended, but not required. If you regularly wear glasses, you need to either wear contacts or wear goggles over your glasses. Loose glasses are not allowed as they will most certainly break. What can I not wear? No sharp objects at all. No belts, earrings, watches, or other jewelry. Please do not wear hair barrettes, clips or bobby pins. No eye glasses unless you have soft goggles to cover them. Yes! You are completely encased from head to thigh in a bubble of air that will protect you from falls and bounces. There are shoulder straps inside the bubble suits to keep you inside the bubble even if you go head over heels. Yes, you do. 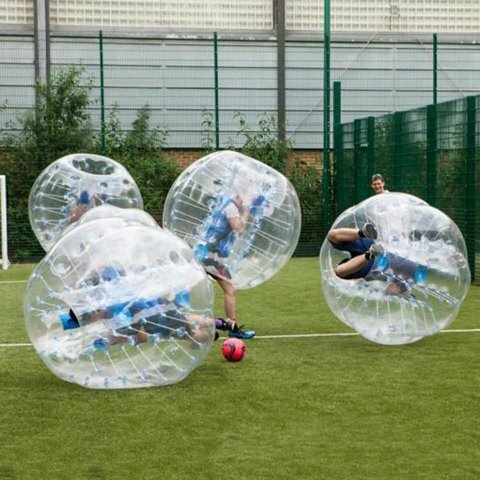 As with any athletic sport, there is a risk of physical injury when playing bubble soccer. We will give you some instruction on what not to do, but you are responsible for playing safely. For minors, a parent or guardian must sign a liability waiver. Do you clean your bubble soccer balls? Like any gym equipment, we'll provide a cleaner so you can clean your ball after the game. We also clean and sanitize all of the equipment on a regular basis.